Puttin' the Black Crappie in B.C. British Columbia is known for it's trout, salmon and steelhead fisheries, but it also has an underrated crappie fishery which savvy anglers have been capitalizing on for decades. While they are a non-native species, black crappie have found a home in the shallow weedy lakes of the Lower Mainland and Okanagan regions. Popular Lower Mainland spots include Hatzic, Mill, and Whonnock Lakes as well as the sloughs around Pitt Lake, Minnekhada Slough and Fishtrap Creek in downtown Abbotsford. Hatzic and Whonnock are known for having huge numbers of crappie, with 50-100 fish days entirely possible during the warmer months, while the sloughs are known for having some big slabs up to 2.5 pounds. Ryan H. with a typical Lower Mainland crappie. Crappie fishing generally picks up in the evenings. I'll never forget the time I was at Fishtrap Creek and realized there were crappie in this marshy-looking urban spot. I spotted a sunken computer monitor near a dock and thought to myself "Man, wouldn't it be funny if there were a fish hanging out in there?" Well, there wasn't just ONE fish. I ended up pulling three hand-sized crappie out of the monitor which sat in about a foot of water. Since that day I've caught crappie in other equally surprising spots, as they are a rather peculiar fish which really enjoys hanging out near man-made structure. Osoyoos Lake is the premier crappie fishery in the Okanagan, while Vaseux Lake is a popular spot as well. 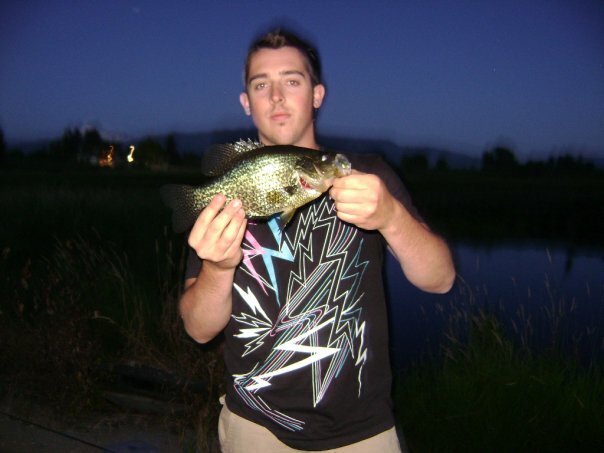 Osoyoos has good numbers of crappie, including some fish in the 1.5 to 2 pound range, and 1 pounders are common. Brent V. with a big Osoyoos Lake crappie. While crappie can be easily caught on live bait such as worms and maggots, catching them on a fly, grub, or hair jig can be more satisfying and less messy. Rigging any of these baits under a bobber will lead to the best results, as crappie like investigating a lure before biting and it will often take a bit of coaxing for them to commit to a bite. While crappie will school in deeper water, they will almost always relate to some sort of cover. Sunken and fallen trees seem to be the preferred locations, while they also enjoy living near weedbeds, docks and any sort of shallow cover they can find. Anglers pursuing crappie will get the most sport out of it with a light action rod. A 3 or 4 weight fly rod can allow for a great fight, same with a 5'6" light action spinning rod geared up with 4 or 6 pound test. Crappie have soft mouths, so a hard hookset is not necessary. Use sharp hooks and set the hook merely by applying weight to the fish. While crappie are good table fare, they are more sensitive to over-fishing than other panfish such as sunfish or perch. I've seen areas which were once abundant with crappie, fished out from a few persistant anglers. The Kootenay River near Creston is also rumoured to contain black crappie. While I've fished the area a bit, I haven't had any run ins with crappie. If any readers have caught crappie in this area I'd be interested to know if they really do exist here so please let me know. Otherwise, I hope you enjoyed this article and I also hope you take the time this season to check out the fantastic crappie fishing we have in our great province. 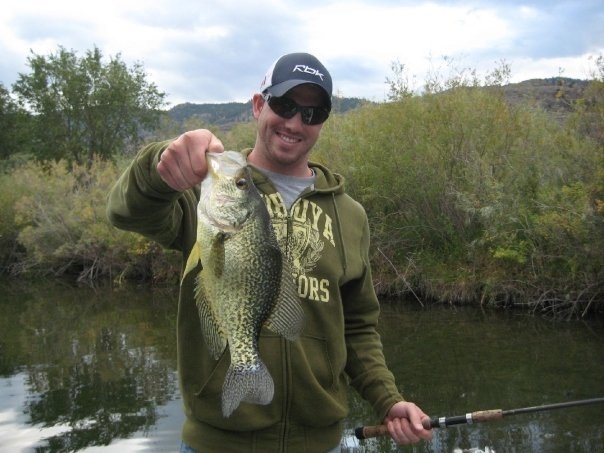 Interested in checking out some of the fantastic crappie fishing Osoyoos has to offer? Drop me a line at bcbasscharters@gmail.com to book your 2012 trip today. Who knows, we might even catch a trophy bass or two.